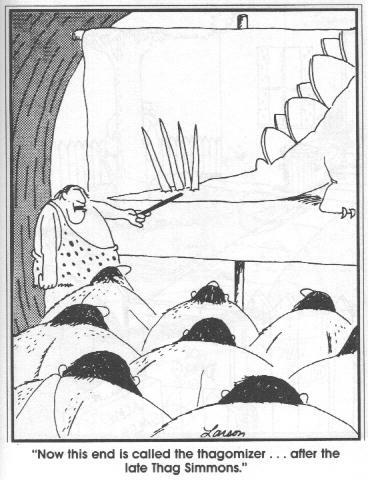 Dinosaurs: Just one of many things that creationists need to explain. After nearly two years in Korea, and another one yet planned, the reader might assume that I generally like this quirky little country of 50 million people, perched precariously on the edge of Asia. The reader would be quite right in this assumption. The country generally has its priorities straight: it has affordable health care, great public transportation, a strong national defense force to confront a real threat, and an emphasis on quality education. The last item on this list–education–is what makes a recent decision by the Ministry of Education that much more disturbing. It was announced that many of the secondary education textbook publishers would be removing evidence supporting the Theory of Evolution from their pages. The Ministry of Education caved under pressure from the euphemistically-named “Society for Textbook Revision,” which is really a front for the various religious organizations that support these measures. Certainly, I am distraught when I hear about similar stories from back home, but the religious lobby has become so powerful in the U.S. that I am no longer surprised. And it is easy enough to write-off these stories in the States as just another example of our polarized and broken political system. But to happen in Korea? This points to a frightening trend, internationally. The U.S. may not export as many goods and services as it once did, but we still export culture at a pace that is currently unrivaled. When our crazies successfully petition the government to get rid of inconvenient truths, crazies all over the world are inspired, and act. I’ve heard the arguments from those that do not believe that creationists pose that much of a threat to our educational system or society at large. I wholeheartedly disagree. Some argue that all ideas should be given a fair shake in the classroom. Should we really be indoctrinating our students? Yes. That’s called “education.” Evolution happens in the same way that 2 + 2 will always equal 4. There are a lot of scientific ideas out there floating around and being hotly debated, but the question of evolutionary theory has been settled long ago, and the evidence keeps getting stronger, not weaker. To teach creationist theology or misrepresent evolution would be the equivalent of handing students a bible and telling them it is Shakespeare. Some argue that students might be made uncomfortable or ostracized when confronted with a worldview that differs from those that they grew up with or believe. Since when has “The right not to be offended” existed? If anything, this makes proper science education more important, not less. If students are being misinformed at home, it is the school’s job to set the record straight, and provide them with the facts. In a world where a nation’s future prosperity is directly linked to its ability to innovate and push science to new frontiers, we cannot let scientific illiteracy grow unabated. It is both a disservice to the child and society when scientific fact is removed from the classroom. A similar argument might be that we need to show sensitivity for religious beliefs. Why does religion get a free pass here when so many other bad ideas do not? We have no problem criticizing each other for differing politics, tastes in music, movies, or fashion, or even in favorite sports teams. But when religion and science collide, deference must suddenly be shown to religion, as false as their claims may be. People will believe what they want to believe at the end of the day, but we should still make every attempt to combat misguided and superstitious beliefs whenever possible. I’ve argued the following in the past, but it bears repeating: this debate over creationism might seem somewhat trivial, but it extends into some very real and important issues. When creationists and religious zealots control our classrooms and political discussions, they hurt science education. In doing so, they allow other nonsense like global warming denialism to gain traction. We need to be addressing these problems (and countless others) with facts and additional research, not by burying our heads in the sand. Not surprisingly, there is a strong element of global warming denialism within the ranks of the creationist movement. Once again, we have a situation where scientific evidence comes down overwhelmingly on one side, and yet the other side still has a proverbial “seat at the table” in the debate. Tiktaalik: Also something creationists can’t explain. For me, the gulf between the science and religion could not have been more stark than it was earlier this week. 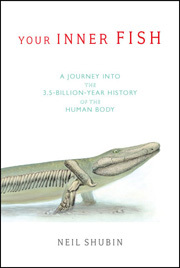 Two things happened on the same day: first, I started the fantastic book, Your Inner Fish: A Journey into the 3.5-Billion-Year History of the Human Body by Neil Shubin, one of the discoverers of Tiktaalik, the 375-million-year-old fish that made headlines as the latest “missing link” (or rather, a “found link”) between fish and amphibians. The book does a wonderful job at clearly illustrating what we have in common with all of our ancestors: from the simplest multi-cellular life, to invertebrates, all the way up to modern man. And of course, fish. It is written in easy-to-understand prose, and by the end of the book, I was left with a sense of awe about how we are all connected, and how simple and slow changes amounted to the dizzying array of life that we see today. Later that day, I came across a glossy and photo-filled little pamphlet that read, “Was Life Created?” It was put out by Jehovah’s Witnesses in an attempt to confuse readers, and presumably lead them to attend their church. Perhaps it’s not fair for me to compare the two. One is a well-researched book by one of the experts in the field, the other is a piece of religious propaganda. However, this is exactly my point: we cannot allow misguided arguments and beliefs with strong ulterior motives to enter into our science classrooms. I sincerely hope that Korea–and for that matter, the U.S.–soon see the error in their ways. Both countries have benefited from great educational systems and innovations in science and engineering. To abandon science just when we need it the most would be a travesty, one with worldwide implications. ← Atheist Me: What’s the Big Deal?